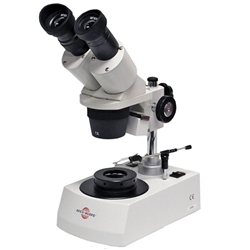 ACCU-SCOPE’s 3052-GEM Stereo Gem Stand Microscope is compact, easily transportable and is ideal for the gemologist on the go! Rechargeable AA batteries allows the user to work anywhere. The 3052-GEM is a simple, cost-effective solution for the discerning gemologist looking for a great value at an affordable price. Optical System: 1x/3x fixed magnifications for viewing stones at 10X and 30X magnification with the included WF 10x/20mm eyepieces. Eyepiece 3. The 3052-GEM is supplied with WF10x/20mm eyepieces. This means it is a Wide-Field 10X magnification eyepiece with a 20mm field of view (i.e. the visible circle when you look through the eyepieces has 20mm diameter. Illumination: Built-in, rechargeable LED illumination provides darkfield illumination and reflected illumination from above. Portability/Stand, bold Powered by a light weight 110V external power supply and rechargeable AA batteries, allows the user to work anywhere. Accessories: Steel wire stone holder allows for multi-angled viewing of various sized gems is included; optional ring holder (810-0135) also available and sold separately. Warranty: 5 year limited manufacturer's warranty for parts and labor, and electronic components.